TM 9-2350-261-20-2 C O O L A N T F L O W D I A G R A M Engine coolant maintains normal operating temperatures. Coolant flow is as follows: Coolant is drawn from the radiator by the cool- ant pump. It is pumped through the oil cooler, and the engine block, up to the cylinder heads, and into the thermostat housing. The coolant then passes through a deaerator elbow and back to the radiator. The deaerator elbow swirls the coolant to remove air. This air is vented back to the auxiliary tank. 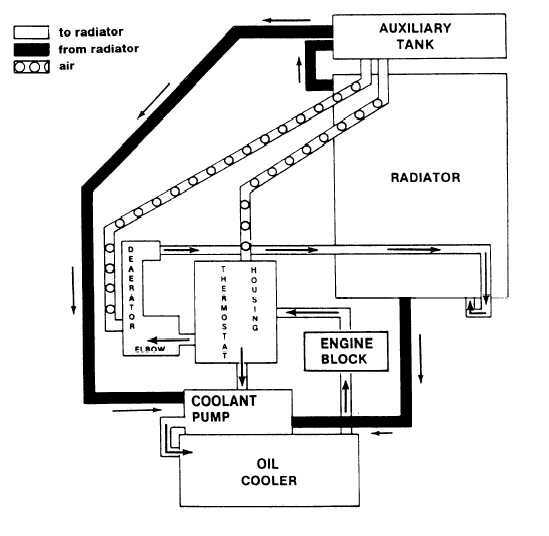 8-2 The auxiliary tank provides for coolant overflow from the radiator. The tank also vents air out through its cap.